As lawmakers grapple with how to close a shortfall in the transportation fund, a group of Republican lawmakers are proposing a sweeping series of reforms to how the state Department of Transportation operates. The proposed legislation released Thursday would make changes to how the DOT plans, designs, and builds roads. It also includes a repeal of the state’s prevailing wage laws, would require public referendums on round-about and wheel tax proposals, and have an outside firm conduct an audit of the agency. “Our biggest concern is that – in all the talk of revenue, bonding, the money side of the equation – we want to make sure everybody realizes…we have some serious problems that need to be addressed,” he said. The proposal comes as lawmakers remain at odds over how to close a shortfall in the transportation fund, which is holding up the ability of the Legislature to pass a new state budget. 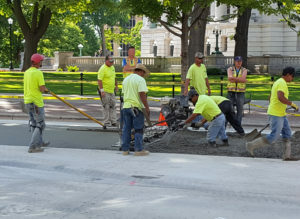 The Assembly has been pushing for the state to find new revenue sources, while Senate Republicans and Governor Scott Walker favor using borrowing to pay for roads. The dispute has resulted in a stalemate that has now stretched for weeks at the Capitol.